Let the countdown begin! Downtown Santa Barbara is excited to officially kick off the holiday season with the 66th Annual Downtown Santa Barbara Holiday Parade, Presented by Consumer Fire Products Inc. The highly anticipated holiday parade steps off promptly at 6:30 pm on Friday, December 7th, lighting up State Street, and bringing the spirit of the holidays to more than 65,000 spectators. This year’s parade will feature giant balloons, magnificent marching bands, community floats, spectacular performance groups, the Holiday Prince and Fairy, and of course the most anticipated appearance of the season: Santa Claus. This year’s theme, “Santa Barbara Shines,” is sure to highlight the creativity of the community, as all participating groups vie for coveted trophies and the ultimate “ooh and ahh” factor from the fans. 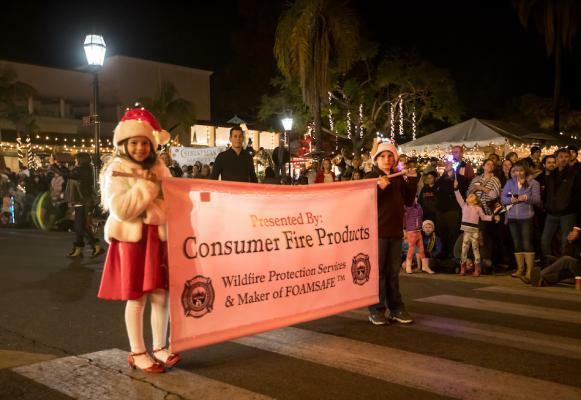 Consumer Fire Products, Inc. returns as the Presenting Sponsor of the parade, with Downtown Santa Barbara once again producing the 80+ entry, uniquely nighttime parade. "We at Consumer Fire Products are thrilled to be the Presenting Sponsor of the Downtown Santa Barbara Holiday Parade and honored to continue our tradition of donating the Community Christmas Tree to light up the holiday season for the fifth year in a row! It's an exciting time of year, and we're grateful for the chance to support the community in such a joyous event," said Irene Rhodes, owner, and CEO of CFPI. The Holiday Prince & Fairy officially kick off and lead the parade down State Street, with the important task of lighting the Community Christmas Tree, signaling the beginning of the Parade. Prince & Fairy contest sponsors Paseo Nuevo Shops & Restaurants brings a new twist to this beloved art contest. Young artists (ages 6-10) may pick up (and return when complete) a drawing template from Paseo Nuevo Management Office (651 Paseo Nuevo) or the Downtown Santa Barbara office (27-B East De la Guerra) or use any sheet of paper no larger than 11”x17”. The Holiday Prince & Fairy will ride in a special vehicle, dressed in festive attire compliments of Nordstrom - these holiday outfits are theirs to keep! For more info on the Prince & Fairy art contest, click here. Floats will be inspired by vibrant colors, kaleidoscopes, rainbows, and anything festively neon and colorful. In keeping with traditions of the past, Santa still reigns over the entire celebration. He’ll make his appearance at the end of the parade in a huge float for an unforgettable grand finale. This custom built float, in partnership with the Santa Barbara Summer Solstice Celebration, is sponsored by Marborg Industries. The public can also join Santa prior to the parade, as he greets families in Paseo Nuevo Center Court for “Photos with Santa,” from 4:00-5:30 pm on Friday, December 7, 2018. Other Holiday Parade sponsors include American Riviera Bank, Hotel Californian, Kimpton Canary Hotel, Montecito Bank & Trust, Santa Barbara Beautiful, Santa Barbara Independent, Santa Barbara International Film Festival, The Towbes Group. Union Bank and Zoom. The 66th Annual Downtown Santa Barbara Holiday Parade, Presented by Consumer Fire Products Inc. will take place on Friday, December 7, 2018, at 6:30 pm. The parade starts at Sola St. and continues down State St. to Cota St. For more information about volunteering for the Holiday Parade, or participation in the Prince & Fairy contest, contact Lisa McCorkle, Holiday Parade Producer, at lisamccorkleflp@gmail.com.